The Eastern Orthodox Church also celebrates St. Valentine but on July 6th, the former date in honor of the Roman Presbyter Saint Valentine, & July 30th, the latter date in honor of Hieromartyr Valentine. February 14th is the name day of Roman Saint, Valentinus. A Saint who had a tradition of courtly love. There is little reliable information on St.Valentinus, but perhaps the most popular story is that he was imprisoned for marrying soldiers who were forbidden, and ministering Christians who were persecuted under the Roman Empire. The first recorded association of Valentine with romantic love was in 1382, in Parlement of Foules, a poem written by Geoffery Chaucer to King Richard II for the anniversary of his engagement to Anne of Bohemia. 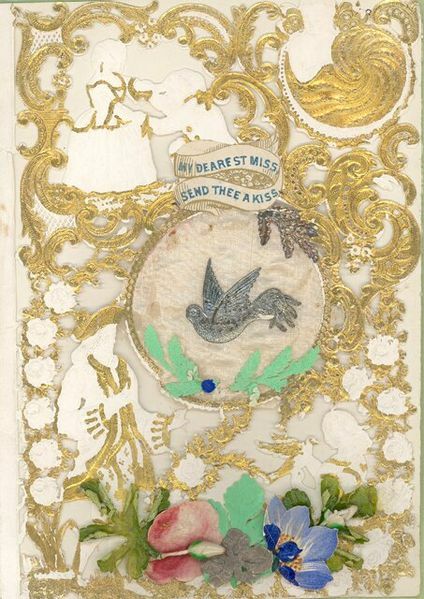 “My Dearest Miss, I send thee a kiss” Date & Postmarked 1862. Addressed to Miss Jenny Lane of Crostwight Hall, Smallburgh, Norfolk. By the 19th century, paper valentines were extremely popular in Britain, and were manufactured in factories to keep up with demand. The valentines began being created with lace, ribbon, colors, pictures, etc. In the United States the first mass production of valentines started in 1847. In the 20th century, it appears cards were not enough anymore and Valentine’s day extended to the giving of candies and flowers. By the 1980’s the diamond business decided to get in on the lucrative holiday by promoting diamonds as the perfect expression of love. Today, the U.S. Greeting Card Association estimates there are 190 million valentines sent each year, and when you include the popular tradition of trading valentines in school, that estimation jumps to 1 billion, second only to Christmas with 2.6 billion. The Internet has created new valentine traditions such as e-cards, e-gift cards, love coupons, etc. An estimated 15 million e-cards were sent in 2010. Today, Valentines day is often called a “Hallmark Holiday” in the United States because of its mass commercialization. St. Valentine’s day has been celebrated in Anglo-Saxon cultures since the middle ages, but it is a rather new celebration in the Czech Republic. It wasn’t really known until after the Velvet Revolution in 1989. Czechs have traditionally celebrated their lovers on May 1st, commonly known as International Labor Day, but also the “Day of Love” in the Czech Republic. Keeping with Czech superstitions, on the 1st of May it is believed couples should find a blossoming cherry tree to share a kiss under to ensure happiness and health. A lot of Czechs still don’t feel much spirit on Valentines day because May 1st is their day for lovers, and some view St. Valentine’s Day as an imported holiday that is very commercialized. Prague. Karel Hynek Mácha Statue Czech romantic poet and author of the love poem Máj (May). 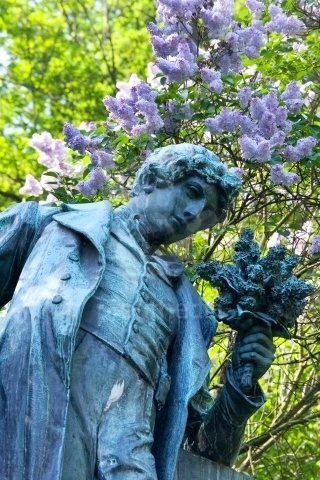 The statue is a meeting place of lovers on May 1st, the unofficial “day of love” in the Czech Republic. Presumably, commercialism, retailers, florist, and restaurant owners are the driving force behind Valentine’s Day increased recognition and celebration in the Czech Republic. Today in the Czech Republic, shops offer a range of flower arrangements and valentine cards specials, and restaurants have special meal deals for two. Of course, making money probably isn’t the only reason the Czechs have started to indulge in candies and flowers on the 14th of February. The spirit of love is genuine on Valentine’s Day, especially among the younger generations. The gifts that are given in the Czech Republic are similar to what is common around the world; a dozen roses accompanied with small boxes of chocolates, cards, dinner in fancy restaurants, and for those lucky ladies and gentleman some jewelry and perfume. Enjoyed Your Blog Chelsea. Love Walking Up Petrin Hill. Not just on May 1 st. Thanks Terry! I have never walked up Petrin Hill, but I’ve seen photos and the view over city looks breathtaking! You just need to make a profile and upload your credentials on them. It is completely free of cost. You will never ask for any money for making profile. That is why Eastern Europe Women Czech dating service has maximum number of satisfied customers. For more details you can log on to their website and get whatever you wish for. Lucidpress is also a great solution for making Valentine’s Day cards. It’s free and offers complete customization. We don’t rent or sell your private information.